I should have saved the title "D Girl" for this post, because that's what I played last night: D. Of course, I didn't know when I wrote the actual D Girl post that I was going to be playing D; Josh told me a few minutes before announcing the lines to everyone. It came about because there was general consensus that one player who occasionally played D would be more useful as a Forward, and with Mifflin out with a knee injury, that left us short on D. I mentioned to Josh that I might be even less useful on D than I was as a Forward, but he said, "no problem, you'll play with me, and you'll be fine." As it turned out, I often didn't play with Josh (because when you're in your own end a lot, it's hard to change both D at once), but I was still fine. Only one really dumb move comes to mind, and that's when I took the puck back around the net, skated up to the left faceoff circle, looked up, saw three opponents on that side, and still passed up the boards on that side. I should have realized that the right side was probably open and skated toward the middle before scouting out a suitable passing target, or I should have looked up sooner and flung the puck around the boards to the right. In any case, my pass up the left boards resulted in the puck popping out right onto their pointman's stick, and he was able to get a shot off (and, if I remember correctly, either that shot or a subsequent one went in). I don't think any of my mistakes (other than that first big one) resulted in goals against, which is good; at least I wasn't a total disaster as a Defenseman. 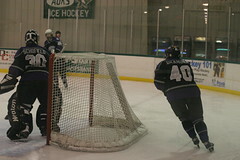 And I know I prevented at least one goal at the end when I blocked a slapshot from the point with my ankle. I was (successfully) tying up a Forward in front of the net at the time of impact, so I didn't even see the shot coming (and thus I can't really take credit for a brilliant play). I had another "WHERE THE HELL WERE MY PADS???" moment and had to come off as soon as the play turned around, and I sent Josh out to take my last shift when Dan came off with a minute to go in the game. My foot was swollen this morning, and I can feel a small knob just above the ankle bone, but there's no sign of injury other than the pain. Oh, and we won 4-3. Yay, us! We drove down to Delaware tonight to see our friend Allison, who plays for the Baltimore Blizzard, play in a game against the Delaware Bobcats. I've been wanting to see Allison play for a long time (she and Al used to play together at Ice Oasis, but Allison moved to Baltimore shortly before Al and I met), and more recently I've had a hankering to find out more about the MAWHL levels. Although I love traveling to tournaments with the Spitfire, in general I haven't found playing on a women's team to be as fun as playing on coed/men's teams. I've been re-thinking this bias lately, however, in light of the fact that my learning curve seems to have flattened dramatically. You see, the women's teams in the area tend to be coached, and though I often (OK, almost always) bristle under authority, I think it might be worth trying to take a little direction in order to improve my game. Lee, my linemate over the summer on the Galaxy, told me a couple times that I should play on a women's team to get more confident with the puck, and the suggestion always puzzled me. I understood the concept of getting more confident with the puck, but I wondered what made him think that just playing with women would accomplish this. I remembered replying once, "well, it depends on the level of the women." Some of the women hockey players I know could easily kick the asses of any of the men I played with on the Galaxy or the Admirals... and playing against *those* women wouldn't do anything for my confidence. Heck, playing *with* some of those women didn't do much to improve my game. I can see now how, perhaps, playing in a more (gak!) nurturing (gak!) environment—one that focused on playing like a team and developing individual skills—might be useful. So anyway, I wanted to see a MAWHL game to get an idea of the level, and of whether I might like it. Allison had played on the Blizzard C team (I actually think it was classified as a B team at the time, but they adjusted the levels) for a while, but she dropped back down to D after having her daughter Nora. (Or was it before? I can't remember, and it doesn't really matter for this story; what's important is that she really likes the team she's playing with now, which happens to be D level.) I would have liked to watch the game together with Al so we could analyze the level of play as it was happening, but Austen was with us, and the reality was that one of us had to watch/feed/hold him at all times. I started out on Austen duty, so I said to Al, "keep an eye on all the players; I'd be curious to know if you think any of them particularly reminds you of me." When I got my turn to watch the game, the first thing I noticed is that no one player stood out as being most like me, mostly because they all looked kinda like me in terms of skill. A couple reminded me more of Kelly in both body type and skating style, and there were definitely a couple players on both teams who could have been up a level, but in general I think I would have fit right in. When I talked to Al about it in the car on the way home, I found that he had the same impression. Both of us thought that I'd have fun playing in a league like this, though of course we have no idea what the coaching is like. As for Allison, my impression was that she looked so much bigger on the ice than she does in person—taller, mostly. Maybe most of her teammates were just very short? I'm not sure. She played D in the aggro style that I recognized (and loved) from my Gang Green days, charging into the zone when the puck was loose and generally playing between the faceoff dot and the blue line when her team was in the offensive zone. I didn't get to see much of her in the defensive zone (because the defensive zone was at the opposite end of the ice when it was my turn to watch the game), but Al said that she was good at skating the puck out. We left about a minute before the second period ended, and by the time we were crossing the bridge on I-95 into Philadelphia we were glad we didn't stay even five minutes longer. The wind, which had been incredibly strong when we left the rink, was now strong enough and cold enough to turn the rain that started to fall into sleet and ice even though the air temperature was still above freezing. I could feel the car sliding around a bit as we got onto 676, and ice started to build up under the windshield wipers. I'm not sure what I'm going to do with the information I gathered at this game, since at the moment the only MAWHL D level teams are all in Delaware, Maryland, and Washington, DC—and D certainly seems like the right level for me. It sure would be nice to play with Allison's team, or failing that, with the Bobcats, but the travel times to games would be anywhere from 45 minutes to 2.5 hours each way even with the closer Bobcats. 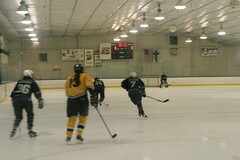 Locally the Philadelphia Freeze, Concord Flames, and South Jersey Demons all have C or C/D UWHL teams; I guess we should try to go to one of those games as well to scout the level. I'm sure the format of this post will only be amusing to the product management, marketing, and PR types at my old company, none of whom are likely to be reading this, but I'm going to press on anyway. + I was put on a line with Diaz, with whom I felt I had chemistry from our first practice together, and it resulted in some great passes. He has a knack for being exactly where I hope he'll be. - I was minus like 100. (OK, maybe that's an exaggeration; I think the final score was something like 8-6, and I was definitely on the bench for one power play goal). +/- I walked onto the ice with one terrycloth skateguard still on, causing a spectacular fall on my part and much hilarity on the parts of my teammates and the referees. The funny part for me was that I saw the black skateguard covering my skate as I stuck my foot out, so I knew the fall was coming—I'd just already shifted my weight and couldn't stop it. I immediately rolled over and stuck the offending skate into the air so Watson could pull the skateguard off for me; I felt him tug and thought he'd gotten it, but apparently he was laughing too hard to get a good grip on it. When I tried to get up, of course the guard was still there, and I fell AGAIN. This time I waited on my stomach while Mifflin (who is on the IR but came to watch—and keep score) pulled it off for real. I've watched many a player come onto the ice with one skateguard on, and I can testify to how wonderfully hilarious it is, so I'm glad I was able to entertain. + My teammates FINALLY caught on to Adam's style of play (why it took them so long, when I've been talking about it here, in the locker room, and on the bench since I first joined the Admirals, is beyond me; I know I'm considered the worst player on the team, but I can still offer some useful scouting information, guys!) and formulated a Plan for dealing with it. - Despite The Plan, Adam was still open most of the time. - I got called off the ice by Lisa (so that Rich could go on) in the final 30 seconds of the game, when we'd already pulled the goalie and had 6 men (including Jeff) on the ice, and we were down by 2. It wasn't as annoying as when Mattias SCREAMED at me to get off over the summer, but it was disappointing nonetheless. It's true that Rich did not get enough ice time during the game, but that's mostly because Lisa and Jeff killed most of our penalties, and for some reason we rested the D when my line was penalty-killing. IMHO, we should have gone with three forwards and 1 D whenever the first line was on the PK—and especially when a D was in the box. + Diaz scored a great goal off a pretty pass (which, sadly, didn't come from me, but given the way we'd been passing in the rest of the game, I took comfort in the knowledge that IT COULD HAVE). - Diaz got ejected at the end of the game when Derek managed to provoke him (by harrassing him and then admittedly diving—twice—when Diaz finally lost his cool). I'm not sure what the official call was, but there was much yelling and name-calling between Diaz and Derek. +/- One of the goals scored against us was by Kitson, who I'd never seen score before. (He probably has, and I just wasn't there to witness it.) I know it contributed to our defeat, but I couldn't help feeling happy for him. - On my first shift, the opposing Center completely flattened me (first by running into me, and then by falling on top of me) when he turned his head to look for the puck carrier while continuing to skate forward at full speed. Serious case of whiplash resulted. I also have a very deep, very sore stick-shaped bruise on my left arm, but I'm not sure whether this came from the collision with the Center or a later check. I've been sitting on this post for a couple days in hopes that I'd think of a positive note to end on, but nothing has occurred to me, and I'm too lazy to restructure the whole thing so that it ends with a +. Maybe the plus is that if the Galaxy is starting to play more like a team, so are we—and I think we're more equipped than ever to compete with them. A couple more tweaks and improvements, and we could definitely win.